I'm a late bloomer. I have come to most of my big realizations and guideposts in life (vocation, serious relationships, marriage, political awareness, owning appliances, etc.) relatively later than the norm. I'm okay with this. It is how I operate and I can do little to change it. The process usually just takes longer for me. I explore a lot, if something is important, before I get to any sort of destination. As for my creative endeavors, I have after 20 years in the theatre just come into my own since maybe 2009/2010. I wrote plays for over 12 years before I finally found my "voice" (and am still finding it). When I create now, I put my name on everything. These days I have purpose and pride in what I do. Everything that I do. Leading up to this point, I was pretty hit or miss. That is as it should be. Theatre, in particular, is a public art. You have to do it, live for an audience, in order to get better at it. And though I feel creatively successful, finally, I am by no means successful with my art in the marketplace yet. I am not known. I will be. I have faith in that. But I know it is a process and I am just now at the point where I am confident in getting my work out there. I'm ready to market myself and what I do. This late blooming is something I've struggled with. Some artists make a splash on the scene at a young age. They come out into the world seemingly fully formed. These sorts of artists, I believe, don't worry too much about if they will be successful, but just how successful. In a New Yorker article by Malcolm Gladwell entitled Late Bloomers: Why do we equate genius with precocity? he cites two kinds of creative geniuses (as defined in David Galenson's study “Old Masters and Young Geniuses: The Two Life Cycles of Artistic Creativity.”)... conceptual and experimental. 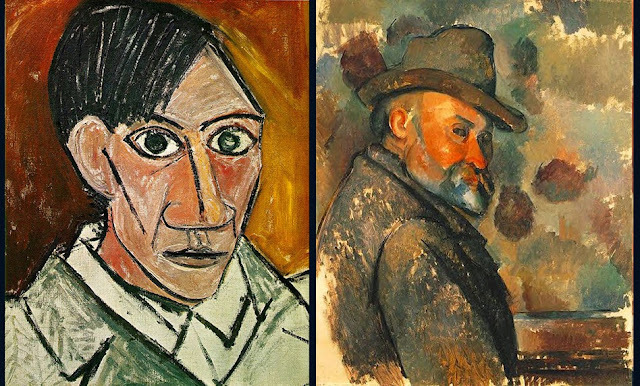 He compares Cézanne and Picasso. Cézanne, though he started his artistic pursuits at roughly the same age as Picasso did, he didn't sell hardly anything until he was in his 50s. Picasso on the other hand, splashed on the scene in his late teens as a full fledged force of nature. Both had a major impact on art. One from the start. Another bloomed late. The Cézannes of the world bloom late not as a result of some defect in character, or distraction, or lack of ambition, but because the kind of creativity that proceeds through trial and error necessarily takes a long time to come to fruition. "Trial and error..." I like that. And I relate to it. I don't feel like I had my art figured out early on (and even now, i still search), but I do feel like I've been on a journey through my process. I've tinkered and toyed with things and tried and failed and gone back to the lab so many times I've lost count. The troubling thing is, while I go about the long exploration of figuring things out, I will appear to be nothing more than a small-time failed dilettante. On the road to great achievement, the late bloomer will resemble a failure: while the late bloomer is revising and despairing and changing course and slashing canvases to ribbons after months or years, what he or she produces will look like the kind of thing produced by the artist who will never bloom at all. Prodigies are easy. They advertise their genius from the get-go. Late bloomers are hard. They require forbearance and blind faith. (Let’s just be thankful that Cézanne didn’t have a guidance counsellor in high school who looked at his primitive sketches and told him to try accounting.) Whenever we find a late bloomer, we can’t but wonder how many others like him or her we have thwarted because we prematurely judged their talents. The whole article inspired me. Being just good right now means I can still be great later. Just gotta stick to it. I'm a late bloomer. And that's okay. More articles about conceptual vs. experimental creators HERE and HERE.